The detail in North West Kardashian photograph dividing fans. The detail in this family photograph that has divided Kim Kardashian West fans. Another day, another photo backlash episode for (increasingly) controversial reality TV star, Kim Kardashian West. The mother-of-three has received criticism in the past for her decisions to allow five-year-old daughter North to wear makeup and straighten her hair. This time, Kardashian West, 38, has come under fire for permitting North to wear bright red lipstick at Christmas. The make up features prominently in a recent Instagram post, mostly because the rest of the photo is relatively monochrome. 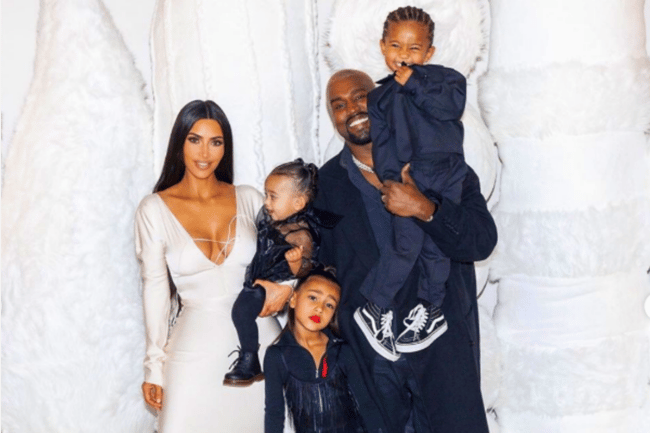 Of course, the intent of the holiday photos – which feature Kim and her husband Kanye West, with their children Chicago, 11 months, and Saint, three – was to wish the world a Merry Christmas. But with the internet being the internet, people took the chance to comment on Kardashian West’s parenting. Because, as they noted, not only was North wearing lipstick, it was bright red lipstick. The comments section was quickly filled with people expressing their displeasure at seeing a young child in obvious make up. However, a number of fans also expressed their support – and encouraged others to mind their own business. But Kardashian West was having none of the criticism, and she finally decided to set the record straight with the mother of all responses, explaining that North herself made the decision to wear red for the “special occasion”. The KUWTK star has previously spoken about North’s love of makeup, even sharing this video of the child making up her mother’s face. In a recent interview with Refinery 29, Kardashian West said, “I already know North is into makeup for sure. “She had friends over this weekend and some of her girlfriends came and they were just all in her room, giving themselves makeovers”, she told the publication. But the KKW Beauty owner does have a few rules for her cosmetic-wearing daughter, as she added she doesn’t think North “should wear lashes or too dark of a lipstick”.